If receiving dating advice from a celebrity is on your bucket list, Delightful.com may be your ideal place to meet singles.Delightful is the brainchild of entertainer and author Steve Harvey, who delivers strategic tips on how to be more "dateable." Established in 2014, the Delightful dating site is a young venture that borrows the familiar format of social media while weaving in branded content. The website offers a mobile app for members, making it easy to browse singles and know who's flirting with you when you don't have time to get to the computer, dedicatedto providing a warm online community for singles to find their partner. With a paid membership, you can read and reply to messages, view profile videos and find out which singles are your astrological match. Use the live chat feature to enjoy one-on-one conversations, which may help you gauge whether your matches have genuine potential. A timeline of updates and profile views is displayed at the bottom of your homepage, providing a handy breakdown of recent activity. Faves make it easy to remember who caught your eye, while Flirts offer a stress-free way to reach out and show your interest when you're not sure what to say. And of course, Harvey's smiling face regularly pops up to dole out tips on choosing the best profile photos or the proper etiquette on your first date. In this era of easy-as-pie online dating, Delightful.com caters to people who want to get their profile started quickly and easily. The sign-up process lasts a few minutes and simply requires entering a few words about your interests. Of course, you can devote more time to fine-tuning your profile and describing the most important characteristics of your potential matches. 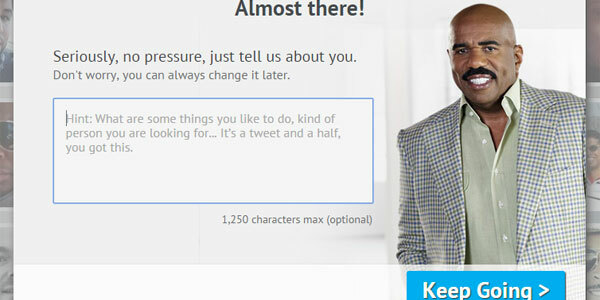 The profile also includes preset interests and questions you can answer to share more about yourself, such as "How punctual are you typically?" and "How much do you like reading?" Delightful offers a free trial, but similar to other dating sites, the limited features may make it difficult to decide whether you want to make a paid commitment. 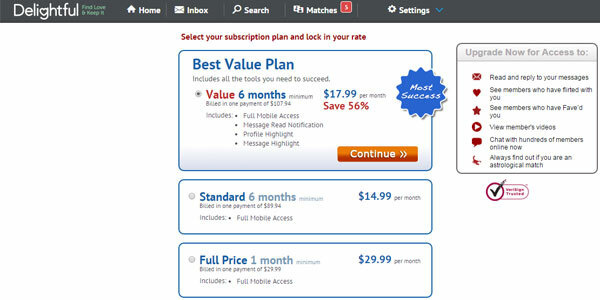 A 1-month membership costs $29.99, while a standard 6-month membership offers the discounted price of $14.99, which is billed in one payment of $89.94. The premium 6-month option is $17.99 ($107.94 in total) and gives you the chance to grab attention with a highlighted profile and messages. The Delightful dating site keeps it easy and breezy with content that continually prompts you to take specific actions on the site. Much like its affiliate Tinder, Delightful frequently presents face-off style matches that let you choose the more impressive candidate between two potential match options. The "Matches" tab at the top of the screen is conveniently highlighted to draw your attention to daily picks, and all the tools you need to interact with other singles are located on the sidebars for quick access. Delightful.com covers the most important search parameters you need to filter out matches that don't meet your minimum age, location and profile standards. When you're in a chatty mood, search for singles who are online now, or plug in specific keywords to track down profiles that are similar to yours. No matter what parameters you choose, always set the age preference as well, because the site defaults to an excessive range (between ages 18 and 120). Steve Harvey's words of wisdom are aimed at showing women how to present themselves in the most attractive light. Anyone who isn't a fan of the entertainer's dating advice isn't likely to enjoy receiving it at every turn, yet these branded tips are the highlight feature that distinguish Delightful.com from other popular online dating sites. If you think Delightful.com isn’t the right dating site for you, check out our review of Zoosk.com a top-rated matchmaking site.